Blue Vervain gets its name from the Celtic word ferfaen, which means “to drive away” (fer) and “stone” (faen). Also called Herb of Grace, Herb of the Cross and Swamp Verbena, this water-loving perennial reputedly invokes protection from snakes and other misfortune if worn or carried as a charm. Unlike some other Verbena species, blue Vervain lacks any scent, but does produce similar flower stalks that support multiple small, pale blue blossoms. The leaves yield a reddish stain when macerated, which remains on the skin if applied as a poultice. Blue Vervain leaves and flowers, together, are tinctured for topical use. Blue vervain is native to North America including the Great Plains regions. Blue vervain, a member of the Verbenaceae family, is a slender, but erect, herbaceous perennial plant that can reach a height of up to 5' tall, branching occasionally in the upper half. The green or red stems are four-angled, sometimes with fine white hairs. The opposite leaves are up to 6" long and 1" across. They are lanceolate, conspicuously veined, and have short petioles. The margins are coarsely serrated with variably sized teeth. The upper stems terminate in a panicle of flowering spikes. These erect spikes are up to 5" long, and densely crowded all around with numerous reddish blue or violet flowers. Each flower is a little less than ¼" across, and has 5 lobes flaring outward from a slender corolla tube. There is no scent. Four nutlets are produced per flower—they are reddish brown, oblong, and triangular convex. The blooming period occurs from mid- to late summer, and lasts about 1 ½ months. The root system has fibrous roots and short rhizomes. Blue vervain prefers full or partial sunlight and moist conditions, a good plant to locate near a small river or pond in a sunny location. Found in river bottom prairies, moist meadows near floodplain woodlands, soggy thickets, borders of rivers and ponds, marshes, ditches, fence rows, and pastures. This plant adapts readily to degraded wetlands and other disturbed areas. The soil should consist of a fertile loam or wet muck. Stratify seeds for 2 weeks then sow indoors. Germination in 14-21 days. Transplant the flowers by mid to late spring, spacing 12 inches apart. Leaves and flowers are harvested while the plant is in bloom. Dry leaves and flowers completely, cut into smaller pieces and store in an airtight container in a cool, dry place. In Egyptian mythology, vervain grew from the tears of Isis, goddess of fertility, as she grieved for her murdered brother-husband, Osiris. A thousand years later, vervain entered Christian mythology as the herb pressed into Christ's wounds to stanch his bleeding, hence its name herb-of-the-cross. Hippocrates recommended vervain for fever and plague. The court physician to Roman Emperor Theodosius the Great prescribed it for tumors of the throat (probably goiters). His fanciful prescription advised cutting vervain into two pieces, tying one around the patient's throat and hanging the other over a fire. As the heat and smoke shriveled the hanging root, the tumor was supposed to shrink. 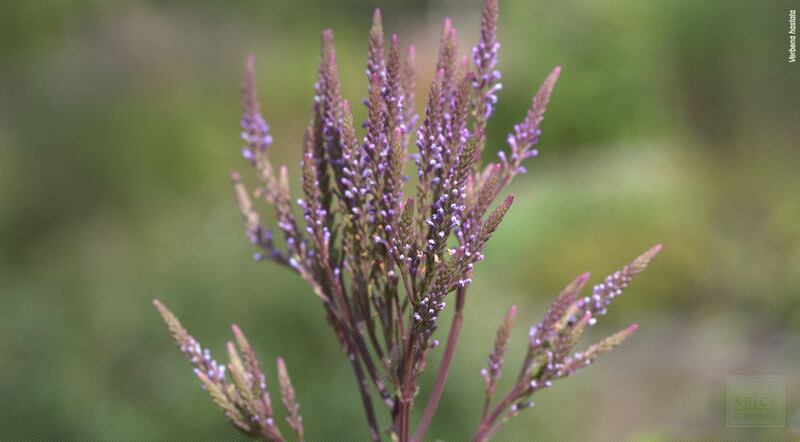 The Romans spread vervain throughout Europe, where it became especially popular among the Druids of pre-Christian England, who used it in magic spells, hence its name enchanter's herb. During the Middle Ages, vervain became a popular acne remedy. Those with pimples stood outside at night holding a handful of the herb wrapped in cloth over their pimples and the blemishes were supposed to disappear. From acne, vervain evolved into a treatment for other skin problems. Seventeenth-century herbalist Nicholas Culpeper wrote: "The leaves bruised, or the juice mixed with vinegar, does wonderfully cleanse the skin, and take away morphew (dandruff)." Culpeper also recommended vervain to treat jaundice, gout, cough, wheezing, bleeding gums, shortness of breath, fever and kidney stones. European animal studies show vervain depresses heart rate, constricts the bronchial passages, and stimulates the intestine and uterus. Because it may depress heart rate, anyone with congestive heart failure history or a history of heart disease should not use it. The possibility of bronchial constriction might cause problems for asthmatics and those with other respiratory conditions. Intestinal stimulation might aggravate chronic gastrointestinal conditions, for example, colitis. And pregnant women should steer clear of vervain because of its possible effect on the uterus— except possibly at term and under the supervision of a physician to help induce labor.